When embroidery meets craft, the results can be Really Fun! A recent quandary over time combined with a bit of selfishness almost made me turn away from an upcoming project. I often convince myself that “I don’t have time,” when, in fact, I usually just want to spend my time the way I want to spend my time! But it was a happy circumstance when I said yes, I would come up with some ideas for crafts that would be suitable for youth (not necessarily little children, but rather younger teens) that could be helpful with some fundraising endeavors. Ok, ok. I got suckered into this! But sometimes, I’m glad I’m a sucker! It’s fun, and the projects that eventually will materialize are fun, too. And since the stars actually aligned correctly to enable me to do more than I intended and produce better results than I imagined, I ended up pretty happy with the initial test session. But the lousy thing is this: I forgot to take photos of the initial prototype-making session. 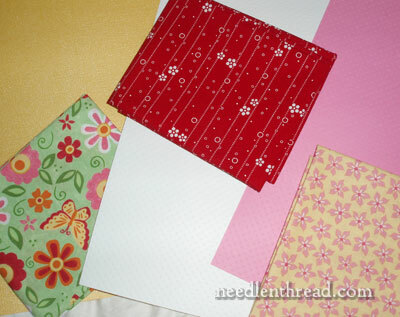 I did manage the photo above, which includes some of the fabric and paper we’ll be using. This is the idea: using a combination of paper and fabric, we are making small gift boxes and bags that will be decorated with embroidery-on-paper techniques and applique (actually, reverse applique…) The projects don’t involve sewing at all – they are basically paper-punch embroidery, glue, fusible interfacing, and cutting and folding. Above are some of the fabric choices, with the coordinating card stock “lining” to the boxes and bags. The first session was a lot of fun – and the next session will be a photo-taking one, so that I can develop some step-by-step instructions. That way, I don’t have to be involved in every step of the process while the kids work. The only drawback to the first session (which took most of Saturday and part of Sunday) is that I didn’t get a whole lot of stitching done last weekend. Nevertheless, today is Wednesday, and for me, that means about two hours of quality time this afternoon with my needle and thread. Tomorrow, I’ll update you on the wool pomegranates, and on Friday, I’d like to talk a bit about “folk” embroidery, in anticipation of some new things that will be showing up on Needle ‘n Thread in March. So just curious – do you often combine embroidery with other crafts and hobbies? Do you have other crafts and hobbies that you pursue, in addition to embroidery? Are you a multi-faceted “doer” of things??? Do share – I’d love to know what other crafts, hobbies, and artistic pursuits capture the creative attention of needleworkers! February 21, 2011 Combining Fabric, Paper, and Embroidery. It Took a Long Time. May 13, 2008 Here’s Your (Embroidery) Sign! I’ve dabbled in jewelry making (the beading type), and actually managed some pretty nice pieces, including a wedding set for a friend with swarovski pearls and clear swarovski crystals. My major other craft, however, is making soap. It’s pretty easy, and it means that I have plenty of soap for our family, and some for gifts and other requests. I even make soap from the fat of the deer that my dear boys (husband and 2 sons) bag during hunting season. None of that involves stitching which remains my main source of creativity. Of course we combine hobbies. Just this week I sewed church pulpit cover and vestments which included applique, hand and machine embroidery. I love to embellish shirts and add embroidery to quilts and banners. The hand embroidery running stitch is of course the same stitch used for hand quilting, but a different medium. We use the stitches to embellish crazy quilts as well. Yeah, I have other arts interests too and sometimes they marge. I like practical, paper-based art (although i devote little time to it and thus make little progress!! ), and card making. The latter I can merge with embroidery by mounting small pieces in aperture card blanks. I used to do dozens of these, but now I only do them for very special things owing to changes in time availability and so on. I plan on doing watercolour backgrounds for embroideries sometime and maybe painting little things onto some card blanks as an extra ‘attraction’. Will need some work on that first…. I’m also very keen on music and am learning to play the viola, albeit slowly and in a rather patchy fashion as I can’t afford lessons just now. I’ve managed to combine this with stitchcraft by creating a simple goldwork viola piece!! It’s in abeyance at the mo, but I plan to work on this one again once I’m through with the current freestyle design. I do a lot of different things: garden, write, paint in oils, watercolours, and acrylics, bead, sing, play a couple instruments, sew, embroider, tat, CQ. I have mixed some tatting and embroidery- on a recent swap, I made a tatted stem and flower, but the leaf was a woven picot stitch. It was fun to combine the two to create something unique! Have a great day! I sew, though nor as well as my mom. I crochet, knit, make bead jewelery, and gift paper bags. I love to do block printing and I want to learn tatting. But embroidery is my most satisfying pursuit. 95% of my “fun” activities involve a needle or hook! Cluny lace, Venetian crochet, invisible applique, decorative heirloom stitching, complex layered/shadowed piecings, invisible darning designs, embedded woven glass seeds inside drawnwork–The smaller and more complex and intricate, the happier I am! And I have great difficulty making a simple baby blanket with regular yarn! I enjoy doing crazy quilting because it combines my love of doing beading, embroidery, sewing and quilting all in one. Near me there are several groups that encourage stitchers to make bookmarks for literacy class graduations. Taking an idea from a friend on paper punched/stitched ornaments I expanded it to paper punch/stitched book marks. We had lots of fun making them for one of these organizations. I got carried away and made 30-40 of them. Uses up leftover bits of varigated floss. Punched on card stock cut 2″ x 6″, readily available at craft stores. Some were matte and some were shiny cardstock. Plain floss looks best on shiny card stock and variagated on the matte finish card stock. After punching and stitching, we backed them with sticky card stock, also from craft store. and DCWV The Metallic Shack Premium Stacks. Don’t have the name of the sticky handy, but it was from one of these companies. Took the same idea and we made ornaments for local library Christmas Tree at another EGA chapter. Cut the shapes at a district school center for teachers, ovals, circles, triangles (for trees) and an ornament shape. Let’s just say that my embroidery is probably going to get short shrift in the next few months as I am looking at a to-do list of five baby afghans to crochet and three wedding cakes to decorate. Heaven help me if the calligraphy bug or the jewelry-making bug hits me in the middle of it all! Do you think there’s a 12-step group that would help? I’ve combined embroidery/sewing, beading/embroidery, etc (“normal” things). But I’ve never (yet) gotten around to combining things like paper crafts/embroidery, or painting/embroidery, or collage type art projects. This is mostly due to lack of time. The other holdback would be questions – what to make, what do I need, how do I…. And I do a lot of petitpoint, using 40 count silk gauze or finer. My big hobbies are quilting, heirloom sewing, and embroidery. Heirloom sewing (and regular sewing projects) for my daughters have been winning for the past few years, and that often involves embroidery on clothing. I’ve learned to smock and do bullions and so on over the last couple of years. My current project is a baby daygown and bonnet for my expected niece’s blessing, and I spent yesterday evening doing featherstitching and flowers on the bonnet fabric. 🙂 Next up: my daughter’s baptism dress, which will have some embroidery at the waist and yoke. I don’t think there is a craft that I haven’t done. I mean that. I dabble in everything, but I feel like my ‘home base’ is embroidery. Ah yes, I have lots of needle interests,and non-needle hobies. Combining stitching and card mnaking is a good way to make quick and apecial cards for special people. I do many kids of needlework, but must save time for the house, yard and motorcycle. Hi Mary, I so enjoy your daily newsletter. I am a newby to learning the correct way to do embroidery from your tips and videos, having dabbled many years “on my own”. My main hobby for years has been sewing and quilting wallhanging sized projects. I currently have a pattern for a Christmas quilt that has 3 panels of embroidery in the design. I love this site since finding it a couple months ago!! I have learned so much from it and Marys e-mails. I read with joy all the hobbies everybody has and how we are all kindred spirits. I teach tap, ballet, Jazz, Hip Hop, flamenco, Irish and Bellydance for a living. I love to garden and have over 50 hardy Hibiscus plants I am in love with. I have always loved needle work. I do tatting, silk Ribbon embroidery, Just learned Brazilian embroidery and have fallen in love with it. Decorate cakes now and then. I have painted in oil, watercolor, Pastels, but mostly china paint. I play the Piano, Harp, Violin and am trying to learn the Guitar. What I want to learn next is Goldwork Emboidery so I can make a gold work basket with silk Ribbon flowers on black velvet. Also in the future I would love to do that pulled thread technique, bobbin lace, and quilt and make Pysanky. they all get a little time but not enough to really sastisfy them all. But doesn’t stop me from trying. I am just beginning with embroidery after doing some cross stitch. Now I also combine it with embroidery on paper (very good as I like to get quic results). My other relevant hobby (beside being a compulsive reader) is cooking and gluten free baking. I love trying new recipes and I hope I will soon be able to create my onw ones. i’ve done a lot of drawing/zentangling lately that i’d eventually like to translate into embroidery. i also spin, knit, bead, and do some cold work with metal. I have been sewing/smocking dresses for 6 granddaughters for quite a few years and often embroider something on them. I am a decorative painter and painted last night. I have been knitting socks since November with self stripping yarn that is fun to work with. I have done needlepoint. This year I made several easy quilts. The trouble is there is just not enough time to do all that I want to do! I’m a scattershot crafter – I love paper so I make lots of cards and little paper projects; I embroider on paper, cardboard and fabric and I sew clothing and home dec stuff, I knit (poorly), I make jewelry (simple stuff – no metallurgy) and I needlepoint and I’m in the planning stage of my first quilt. I read constantly and I garden and I cook – though not as obsessively as I used to. But I spend WAAAAY too much time planning my projects, then losing interest and moving on to planning another project. So pathetic! But I do enjoy myself. I have never heard of paper punch embroidery so I am very intrigued and can’t wait to see the next post. I love all kinds of needle crafts, embroidery, Xstitch, sewing, knitting. I find it extremely tactile and therapeutic. my other love is metal detecting and I mention this in relation to thimbles, I have found lots in fields all over the UK and many of them date from Medieval times. Looking forward to more pomegranate corners! I quilt, embroider,and applique. I use embroidery on my quilts and with my applique blocks. It really dresses them up. I also love to knit and crochet and have embroidered on my knit items. I’ve been reading your blog for sometime now and you have inspired me to add needlepoint to an already long list of fiber art. I do it ALL, crochet, knit, embrodery, garment sewing, quilting, craft sewing, scrap booking, draft my own patterns, and mixed media with fiber whatever. I’m young 29 and I think learning traditional crafts is important. If there are kids in my future they WILL learn some traditional fiber art. I figure someday it’ll all end up in one great piece of art work. Keep teaching me I love it! Hi Mary, you said you was interested in what other crafts we did, I have been a bobbin/pillow lacemaker for over 20 years, been beading for about 3 years and taken up the knitting needles again with embroidery fitted in between. I am the membership secretary for our local Womens Institute and a world wide cricket society also Chair of The Rockingham Lacemakers baced in Yorkshire, UK. Thanks for a very interesting newsletter which I look forward to reading each day. I often combine quilting and embroidery. Not that much embroidery appears on the quilts, but it does show up. I often embroider the patch for the back of the quilt which includs the quilt title, my name, and the date. But sometimes I’ll include a little embroidery on the quilt top. I can’t wait to see how the boxes turn out!! I do blackwork, quilting, applique, cartonage (fabric covered boxes) picture framing, cross-stitch, needlepoint, stumpwork, children’s dressmaking, alterations of men’s clothing, bookbinding, goldwork, computerised machine embroidery, hardanger and pulled thread work. However, I finish every day with your new idea for the day and look forward to the next day. I am a carer and I work full-time as well, as you know and have three grandchildren who are our joy. Just do what you want to do and blow the ironing – unless it’s pressing a quilt block! I do embroidery on paper, often incorporating silk ribbon work. I use these cards whenever I write to family and friends and they are usually appreciated. I make special birthday and Christmas cards this way during the year so I have a supply on standby. The patterns used in string-craft, string and nails on wood, look modern without looking cute. Your youth group might enjoy that. Whilst embroidery and designing can be all consuming I think it is essential to develop other interests which may work in conjunction with your passion for needlework but bring out hidden talents. When I started designing I had very little knowledge of computers so I went on a beginnners course which led to a two year Adobe Dreamweaver computer course which in turn led to my site. This in turn led to a need to take better photographs which led to an intensive photography course. I am wondering what the next development will be – I might even find time to cook!! I do multiple crafts, so use embroidery in a lot of projects. I did your heart design and just finished the egg, which I need to stuff. It is fun to do them into designs that you can stuff and use as hangers or bowl fillers. I have the heart on my blog and will get the egg finished next. I knit and quilt and am a beginner at embroidery. We live with 6 months of Winter so knitting and quilting are useful as well as multifaceted art forms! All three hobbies involve patience and beautiful materials (is there anything better than beautiful fabrics and fibers?) which is fun. Plus–they can be portable—-sometimes not– which means your hobby can travel with you. Oh my, yes, I am ADD when it comes to crafts! In addition to embroidery (cross stitch, needlepoint, redwork, hardanger to name a few), I quilt, knit, crochet, sew clothing (modern and 1880s). Non needle related, I like scrapbooking and cake decorating. Eu tenho acompanhado o seu trabalho, sou Finlandesa e moro aqui no Brasil. Participo de uma Escola de Bordado cujo Site é (Escoladebordado Lee Albrecht.com.br)Acho maravilhoso a divulgação do seu trablho. Você está de parabens. Eu tenho aprendido muito.Eu faço bordado, blackwork, ponto cruz,stampwork, frivolité e muitas outras coisas. I do combine other crafts with embroidery. I also like to knit, crochet, cross stitch, tatting, silk ribbon embroidery and dress making. Right now I’m knitting a throw for my daughter and also doing a cross stitch project. With the help of my daughter, I am also planning to fabric paint cushions. I love embroidery! It’s a new love for me, I just started a little over a year ago. I also crochet, bead, make beads and jewelry, do embroidery on paper, and do Iris-folded cards. I’m a writer too. I write poems, short stories, the occasional play, and have written a novel. I love the question. I sew and have my own sewing business, specializing in but not limited to, heirloom sewing. I knit and weave and needlepoint and cross stitch and embroider and smock. I also design and make jewelry. I have just begun to use an “embellisher” and am developing products using it. I cross over all these disciplines. Many of my sewing projects contain embroidery and beading. The children’s clothes I make lend themselves beautifully to embroidery by hand and by machine, though hand work is my great pleasure. And, yes, I generally have several projects of all different types going at the same time. Right now I am warping my loom, doing a cross stitch project for someone, knitting a baby sweater, sewing a chenille rug and in the midst of several jewelry projects. I love what I do. My other consuming hobby is cake decorating, mainly making sugar flowers by hand. I often find that one hobby mirrors the other and having made many sugar flowers, it helps when I am embroidering as I already know their design. It’s fun too, to compare the sugar ones to the thread blossoms. I’ll do a post on my blog about this. http://qualquermotivo.blog.uol.com.br/arch2010-10-31_2010-11-06.html that I made with soap boxes and Heat’n Bond Lite for little christma’s gifts. I am an artist. I work on collage, art quilts, altered books, cross stitch, all kinds of needlework,working on a crazy quilt vest now,tatting and all kinds of art work. Punch needle and photography. Love my computer and belong to lots and lots yahoo groups. Beading of all kinds. Just about any thing that hits my interest. Right now I’m knitting but also do some crochet, counted cross stitch … have done crewel, needlepoint, oil painting, sketching, origami, quilting, bobbin lace (want to do more! ), and Swedish Weaving, which I’ve liked since seeing it as a child. Here’s a link to a site with smocking instructions and photos. Hope it helps!